"Welcome to Jupiter!" flashed on screens at mission control at NASA's Jet Propulsion Lab in Pasadena, California. The Juno team cheered and hugged. "This is phenomenal," said Geoff Yoder, acting administrator for NASA's Science Mission Directorate. "Through tones Juno sang to us and it was a song of perfection," said Rick Nybakken, Juno Project Manager, referring to the audio signal the probe sent to indicate it was in orbit. Juno was launched nearly five years ago on a mission to study Jupiter's composition andevolution. 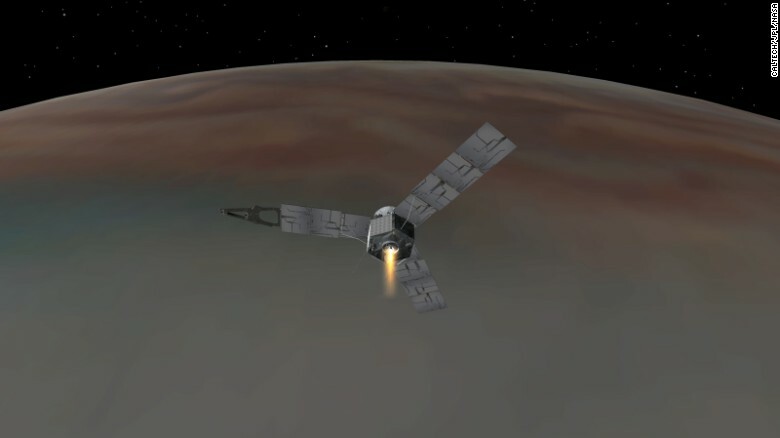 It's the first spacecraft to orbit Jupiter since Galileo. Galileo was deliberately crashed into Jupiter on September 21, 2003, to protect one of its discoveries -- a possible ocean beneath Jupiter's moon Europa. "Preliminary looks are that the spacecraft is performing well ," said Guy Beutelschies, Director of Interplanetary Missions at Lockheed Martin Space Systems, the company that built the spacecraft. Steve Levin, Juno Project Scientist, looked ahead to turning on the probe's instruments again, after they were turned off in preparation for the tricky orbit maneuver. "What I'm really looking forward to is getting up close and personal with Jupiter," he said. The largest planet in our solar system, Jupiter is a huge ball of gas 11 times wider than Earth and 300 times more massive than our planet. Researchers think it was the first planet to form and that it holds clues to how the solar system evolved. Spacecraft have been to Jupiter before. But scientists still are puzzled by the gas giant. What's going on under Jupiter's dense clouds? Does it have a solid core? How much water is in its atmosphere? And how deep are those colorful bands and that mysterious giant red spot? Juno will help answer those questions by looking at Jupiter's interior. The spacecraft will orbit the poles and try to dodge the planet's most hazardous radiation belts. To protect the spacecraft from the radiation, Juno has a shielded electronics vault. At a press conference following the probe's successful arrival in orbit around Jupiter, NASA showed a video shot by Juno on its approach of Jupiter's moons traveling around the planet, capturing for the first time the movement of objects around a celestial body. "In all of history, we've never really been able to see the motion of any heavenly body against another," Bolton told CNN, describing Jupiter and its moons as a "mini solar system." "You have multiple moons going around Jupiter, and each one is going around at a different speed, based on its distance away from the planet. This is the king of our solar system and its disciples going around it. It's very significant, we're finally able to see with real video, real pictures, this motion that we've only been able to imagine it until today." Juno is a spinning, robotic probe as wide as a basketball court. It will circle Jupiter 37 times for 20 months, diving down to about 2,600 miles (4,100 kilometers) above the planet's dense clouds. The seven science instruments on board will study Jupiter's auroras and help scientists better understand the planet's origins, structure, atmosphere and magnetosphere. Is shrinking superstorm evidence of climate change on Jupiter? An onboard color camera called JunoCam will take "spectacular close-up, color images" of Jupiter, according to NASA. The space agency is asking the public to help decide where to point the camera. Three 1.5-inch Lego figurines are also on board Juno. One is a likeness of Galileo Galilei -- the scientist who discovered Jupiter's four largest moons. The other two represent the Roman god Jupiter and his wife Juno. They were included to inspire children to study science and math. Juno's main spacecraft body measures 11.5 feet (3.5 meters) tall and 11.5 feet in diameter. But with its three solar panels open, it spans about 66 feet (20 meters). For comparison, an NBA basketball court is 50 feet wide and 94 feet long. Jupiter was 445 million miles (716 million kilometers) from Earth when Juno was launched from Cape Canaveral on August 5, 2011. But the probe has traveled a total distance of 1,740 million miles (2,800 million kilometers) to reach the gaseous planet, making a flyby of Earth to help pick up speed. "After a 1.7 billion mile journey, we hit our burn targets within one second, on a target that was just tens of kilometers large," said Nybakken. "That's how well the Juno spacecraft performed tonight."